Robert J. Sawyer » Blog Archive » Busted by Bundoran! by Rob - December 18th, 2008. Hee hee! Bundoran Press, the wonderful SF&F publisher in Prince George, British Columbia, has just put the above photo of me on the main page of their website. 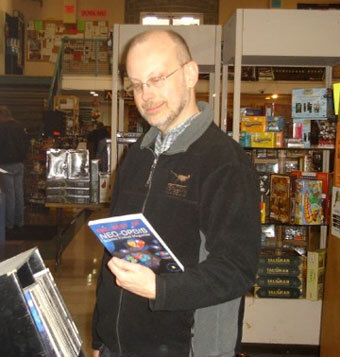 It was taken November 10, 2007, at Sentry Box, Calgary’s great science-fiction store. 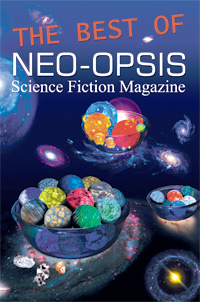 The book I’m looking at is the terrific anthology The Best of Neo-Opsis, culling the top work from one of Canada’s major SF magazines, including stories by Suzanne Church (who’s in my writers’ group), Darwin’s Paradox author Nina Munteanu, and Hayden Trenholm (one of my writing students, and author of Defining Diana, also published by Bundoran). Check out the book, and all of Bundoran’s offerings.